Stress is a part of life, whether we like it or not. And our body has a system in place to manage stress. However, this system can experience dysfunction, just like the rest of our body. We can measure the health of this system with an adrenal function test. The adrenal glands are small glands that sit on top of the kidneys and produce different hormones. The adrenal glands produce the hormone cortisol along with the catecholamine hormones adrenaline and noradrenaline. The test includes a measure of salivary DHEA-S (dehydroepiandrosterone sulfate) and 4 markers of cortisol that is plotted on a curve to assess how secretion happens throughout the day. The adrenal glands produce cortisol 24 hours per day. Cortisol output is highest within the first hour after waking, declines steadily through the day, and reaches a low during sleep. 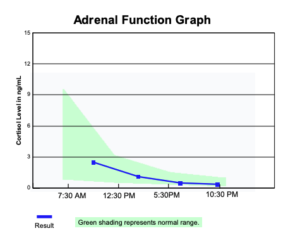 Adrenal dysfunction changes the trajectory of the cortisol profile. Measuring cortisol levels at scheduled times throughout the day provides important information on how your adrenal, hypothalamus and pituitary glands are managing your stress. Factors that contribute to dysfunction may include acute or chronic stress, obesity, metabolic syndrome or diabetes, and hypothyroidism. Call us at 416 214 0100 to book an appointment and get your stress response assessed.